How Well Do You Know Arizona? Arizona is home to a lot of natural wonders and gems. 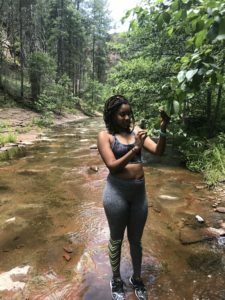 Whether an AZ native or AZ newcomer, there are cool places to visit here (if you enjoy the outdoors), especially for winter break, or with family that will be visiting for winter or spring graduation. Fossil Creek is in northern Arizona, near Strawberry and Camp Verde, about 3 hours from Phoenix. It is a National Wild and Scenic River and is preserved as such. It is most known for its waterfall, hot springs, and whirlpools. I have visited twice, but I have never made it to the hot springs. You can visit throughout most of the year, but the best time to visit is in the Spring and Summer due to the weather, however, that means this time of year is also very busy. Fossil Creek also occasionally gets shut down due to wildfires. After the first two hours of driving to the creek, you will approach a 15 mile road on a mountain to get to the trailhead. There are numerous trails; your trailhead is based on the type of permit you buy. The two closest trailheads are 0.5 miles and 1 miles, respectively, from the waterfall – the main attraction. On my second visit, my partner and I look an off-map trail that allowed us to walk along the creek until we arrived at the fall. Fossil Creek waters are in variances of blues and green and can be very cold, which is usually what we need to survive these hot summers. When you arrive at the waterfall, you will see a large swim hole with people enjoying themselves, and some even jumping off of the waterfall! If you plan on camping or hiking at Fossil Creek, you will need order a permit first, which is available here. There are plenty of trails in Sedona, but my favorite so far is West Fork Trail. It is a six mile out and back trail located in Oak Creek Canyon in Sedona. I have attempted West Fork Trail three times and finished it once. It is a nice trail to go back to because it looks different depending on the time of year. In spring, it is cold and there is consistent, rushing water on the trail as a result of the snow melting from winter. The trail is warmer in the summer and has significantly less water, but allows you to see more rock dimensions. The fall at West Fork is a nice mix between the spring and summer. Sedona is about 2 1/2 hours from Phoenix (depending on the traffic), and you will know once you’ve arrived due to the dramatic landscape changes. The scenery transforms from flat green and yellow land with brown mountains to red rocks and hilly terrain. 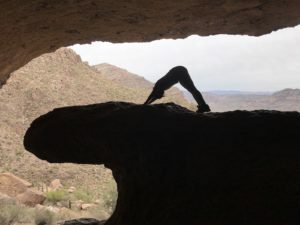 The Wave Cave is one of many trails at Superstition Mountains, which is near Gold Canyon. It is a three mile hike and was the most difficult for me on this list. There is a lot of big steps, and the last mile involves climbing. I don’t remember much about the hiking up portion because I was so focused on getting to the top, which is the main attraction, the wave! Part of the mountain has a formation that looks very much like a wave…in a cave…The trail is heavily trafficked, so there were a lot of people waiting for their turn to take photos and eating lunch in the open cave. It is not a trail I would do again, but I encourage everyone to go once to see the wave and view! The Grand Canyon is about four hours from Phoenix and is the main Arizona attraction. I visited for the first time during my freshman year of undergrad, but it was uneventful. We walked around looking at the canyon for a few hours. I would like to go back and do one of the many activities offered. Some include riding mules, water rafting, hiking the Grand Canyon (4-12 hours, depending on the trail) or a helicopter tour. It would be great to see the Grand Canyon from another perspective. If you visit or live in Arizona, you have to see the Grand Canyon because it is one of the 7 Wonders of the Natural World! 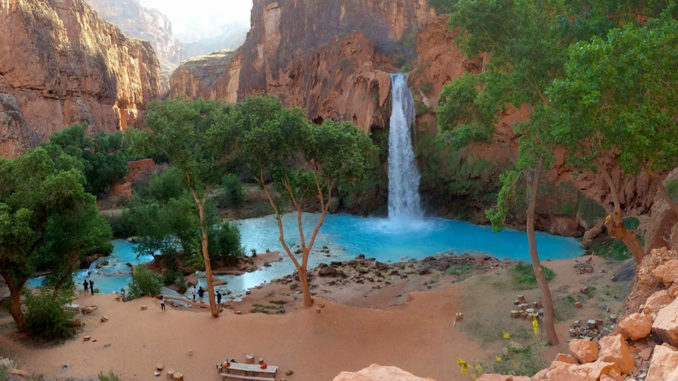 However, I would argue that the best outdoor attraction in Arizona is Havasupai Falls, which is a part of the Grand Canyon. I have not visited yet, but I plan to post-graduation. It features five waterfalls with the bluest water in Arizona. There is either a hiking or camping option, and it does require a permit. Havasupai Falls is a popular attraction, so you may need to apply for the permit up to a year out. Whether hiking or camping, it takes days to complete the trip and is riskier during monsoon season. Monsoons that sweep through Havasupai Falls turn the falls brown and can cause flash floods, which are extremely dangerous. It is 10 miles just from the parking lot to either the lodge (if hiking) or campground, and that’s even before you start the journey to the falls! But based on the photos, the trip definitely looks worth it.